After the stunned appreciation of the Zone-tailed Hawk that passed over the Cape May Hawkwatch Platform on September 27th (where is it now, I wonder...), plus an awesome season for many other raptors here, thanks to persistent north-west winds, one might be forgiven for thinking that we have had the cherry on the cake for this year. But not so it seems - and anyway, who says cakes have to have just a single cherry?! 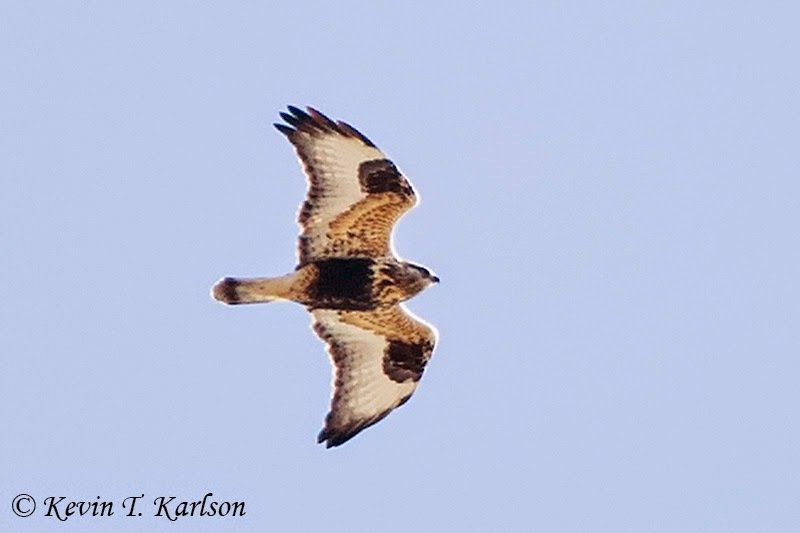 Though Rough-legged Hawk is by no means a rare visitor to Cape May County, in a typical year one might expect to see just one or two, generally spending the winter in the extensive, open marshes at the northern end of the county - Jake's Landing and Tuckahoe WMA are the 'classic' locations. Further south they are far less likely, while a bird south of the canal is always something to cherish. Those lucky enough to be at the Hawkwatch Platform around 2:30pm yesterday were therefore in for a treat, as Steve Bauer called out a Rough-legged Hawk, way, way out there, somewhere over West Cape May. 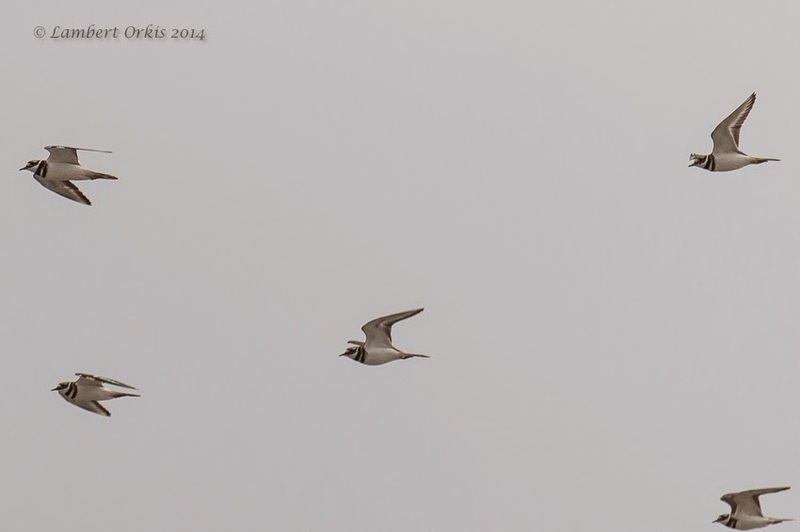 As we struggled to find detail on the bird, but consoled ourselves that we really could see the suggestion of a dark belly patch and a pale leading edge to the wing, the bird set a course that was going to bring right past the platform. 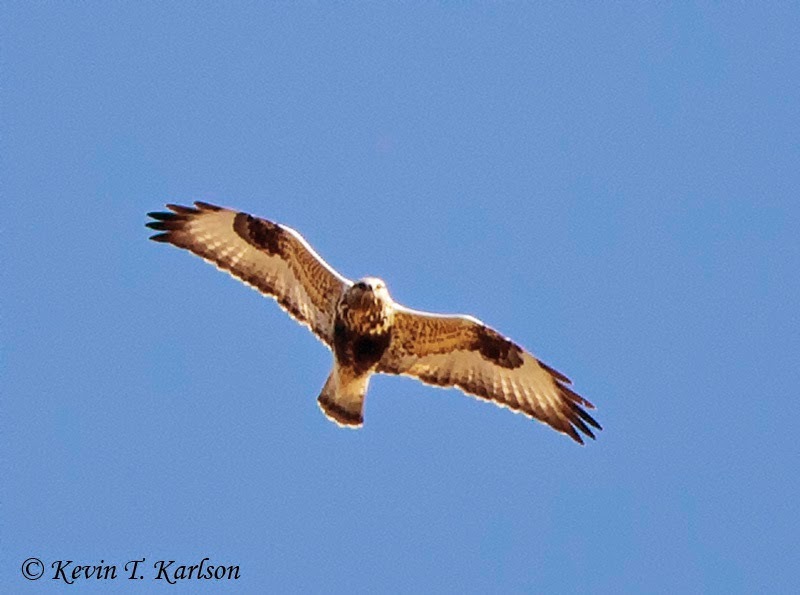 Rough-legged Hawk at Cape May Point yesterday. Rough-legs are rather variable in plumage, but light morph birds such as this are a fabulous sight and readily identified by the solid black belly patch and large, black carpal patches on the wings [photo by Kevin Karlson]. While you are there... don't forget to scan around you at ground level while at the Hawkwatch Platform. 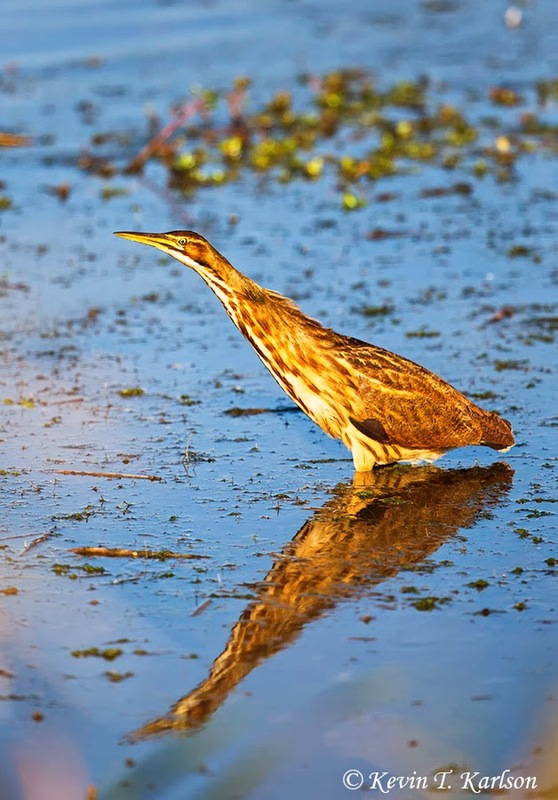 Bunker Pond, the nearby cedars, and even the grass in front of the platform are all great places to find birds - this American Bittern has spent a couple of days now, feeding in the open along the edges of Bunker Pond and giving excellent photo opportunities [photo by Kevin Karlson]. Cape May in fall really is a phenomenal place; I know we've said it before but, so long as the birds keep coming, you can't blame us for crowing a little (pun intended!). The 2014 Cape May Autumn Weekend is over, the dust is just about settling (once the emails have been dealt with!) and we can reflect on what has been an amazing event. First and foremost, we at Cape May Bird Observatory should like to thank those of you who came, for without you, there would be no event. We should also like to thank the donors, vendors and other supporters, without whom their also would be no event. And we should also like to thank the incredible army of volunteers that help CMBO and New Jersey Audubon for, without them, there might be an event, but it wouldn't be a success. All of the above can be arranged, and was, mostly by the amazing organizational skills of Rene Buccinna - for much of the time, the rest of us just did as we were told. But what could not be arranged was the birds, so here I want to celebrate at least some of them - for 205 species of them not only showed up, but disported themselves before our delighted audiences and I don't have space to celebrate them all here. I should also like to thank the generosity of those who came to the event, then took time to forward photos for inclusion on this blog - thank you one and all. 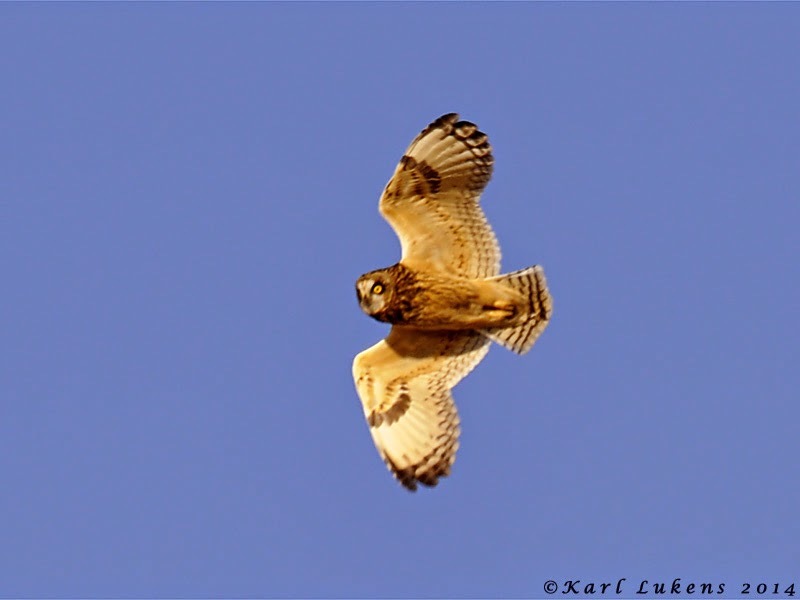 Early morning brings great birds, and high on everybody's list of things to do was a walk at The Meadows, where up to three Short-eared Owls could be found over the weekend. 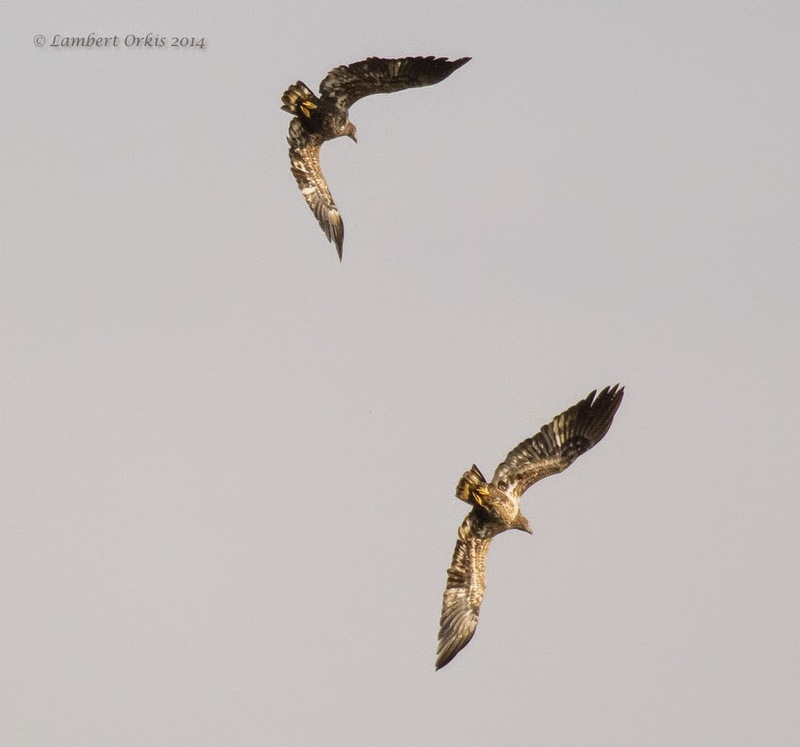 These two put on a great display for one of our walk groups [photo by John Patterson]. And it's worth another shot - for the identification officianados, note the way the dark on the primaries bunches towards the wing tips - Long-eared Owls have more regularly-spaced dark bands [photo by John Patterson]. Sharp-shinned Hawks were a major feature of the Autumn Weekend, with sometimes up to 20 in the air at once, all giving some serious grief to the Northern Flickers, Blue Jays and assorted smaller fayre that make up a smorgasbord for these feisty hunters (or should that be smorgasbird? - You had to be there on Friday night) [photo by Doug Gochfeld]. 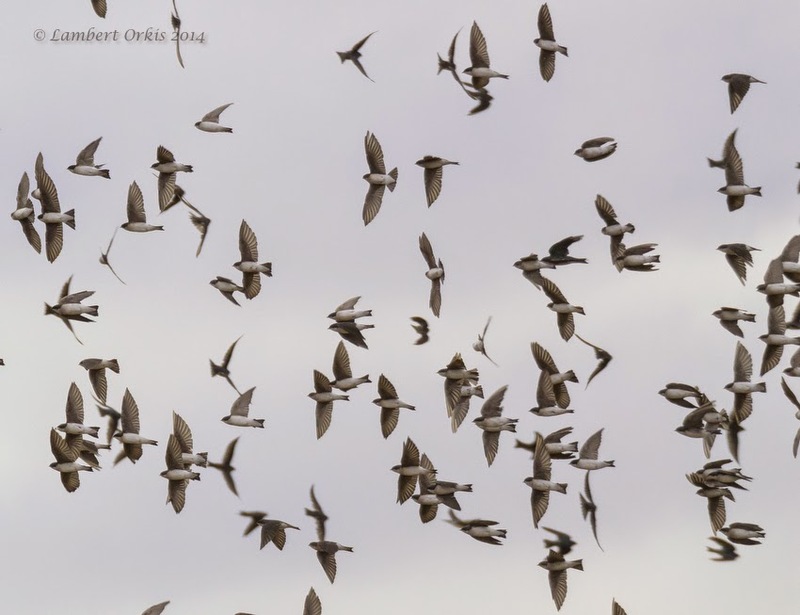 Every bird had a story to tell this weekend - Thursday the 23rd saw a spectacular movement of over 600 Killdeer pass the Hawkwatch Platform and smaller numbers continued over the weekend, bringing with them an assortment of other shorebirds [photo by Lambert Orkis]. 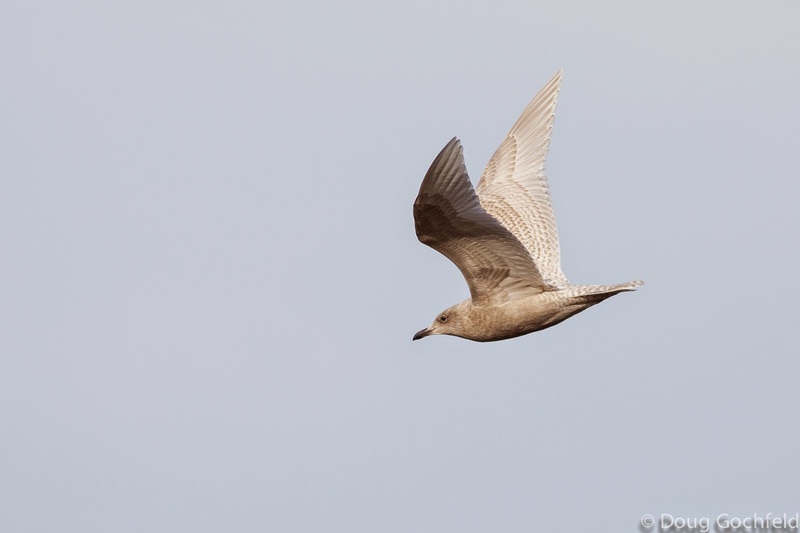 Another view of the Iceland Gull as it drifted past the Hawkwatch Platform on Saturday. 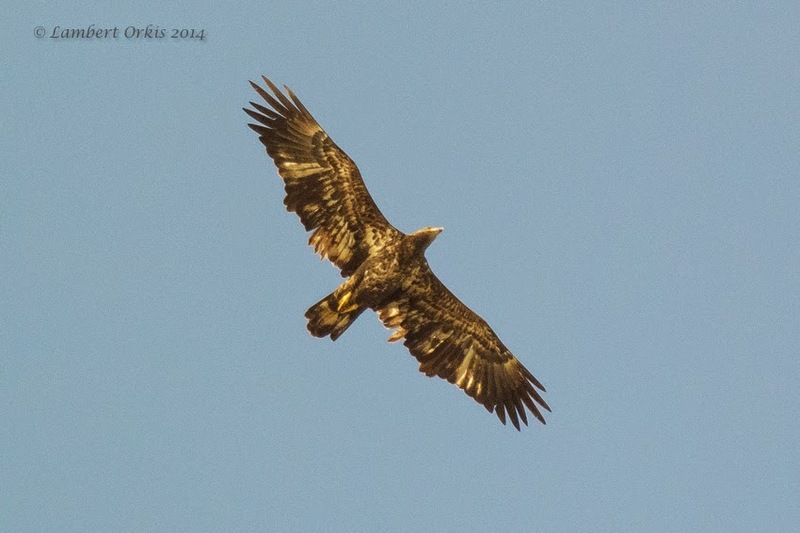 Note the all dark bill and subtle dark markings on the flight feathers and tail [photo by Doug Gochfeld]. 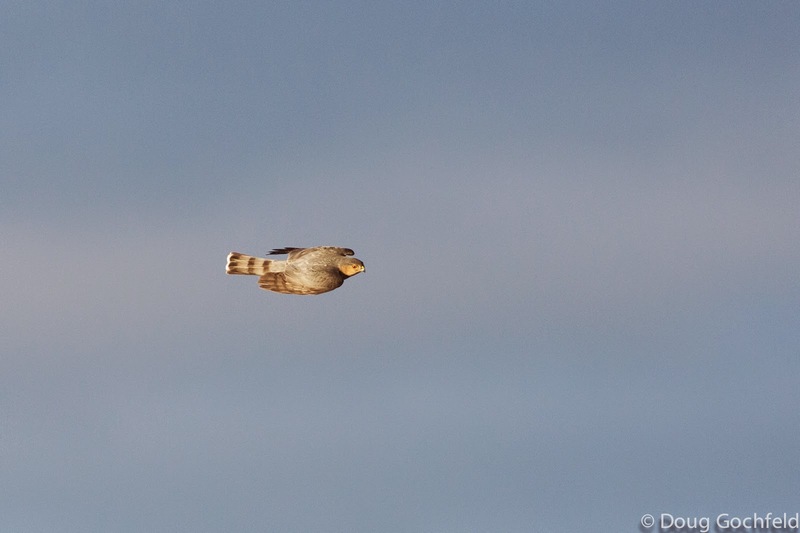 Some birds are prone to soaring, others are not. But sometimes, some birds just don't read the books! 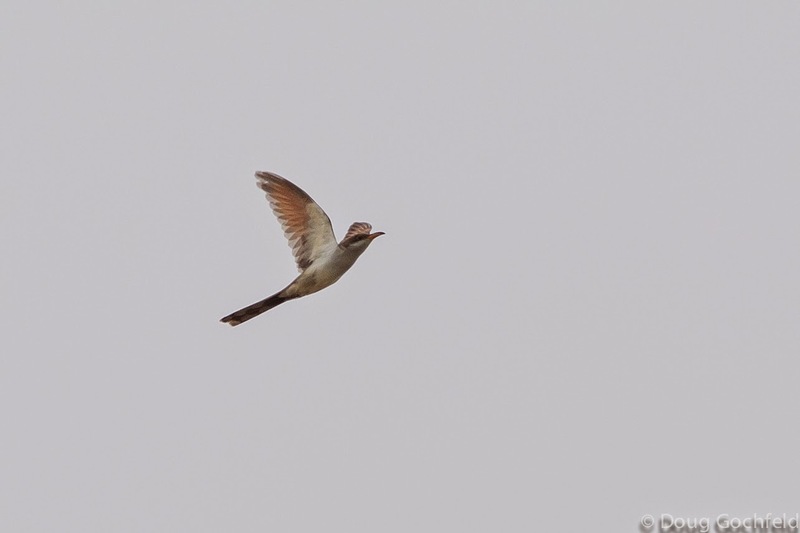 A Yellow-billed Cuckoo, gaining height over the state park parking lot in late October and heading out over the lighthouse is something that will almost certainly be a once in a lifetime thing, for those of us who were there to witness it [photo by Doug Gochfeld]. 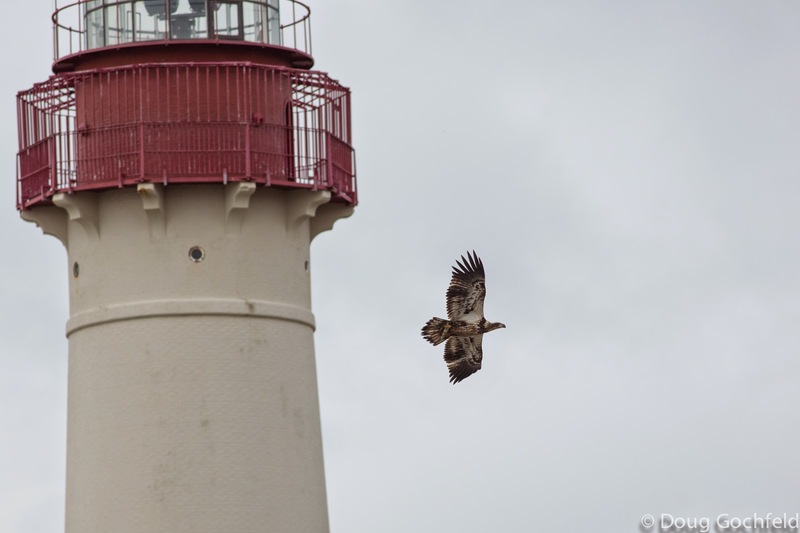 And talking of the lighthouse; Cape May birders get great pleasure in photographing their birds with the Cape May lighthouse in shot - so it is only fitting to offer up a Bald Eagle being very obliging over the weekend [photo by Doug Gochfeld]. Ducks were high on everyone's list of things to be appreciative of this weekend, as an amazing array of species was waiting to be studied over the weekend. 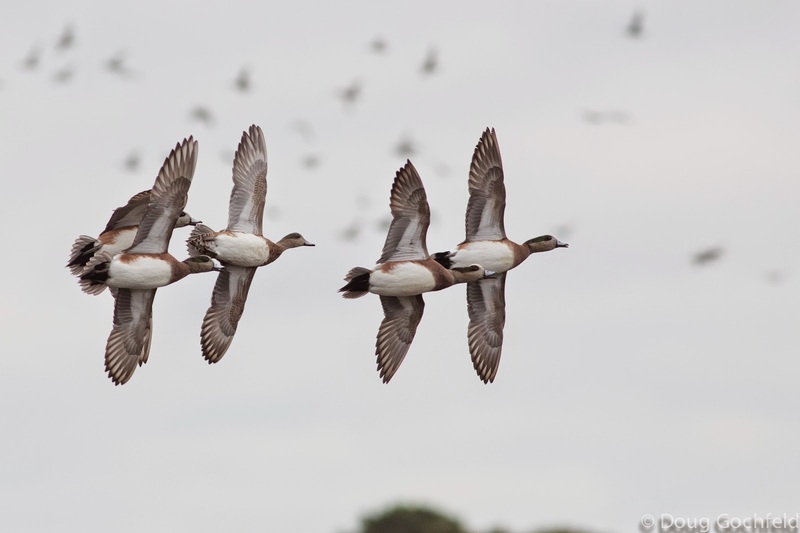 This great flight shot shows what great opportunities came the way of photographers this weekend, as a party of American Wigeon passes the Hawkwatch [photo by Doug Gochfeld]. With so many walks going on at once, there will always be the one that got away - but sometimes, lady luck can be on your side. 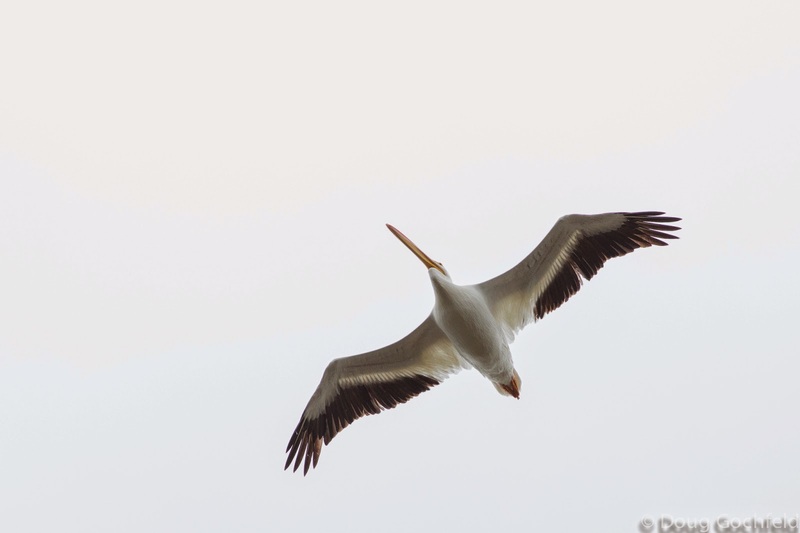 This American White Pelican made a grand pass over Cape May Point on Saturday and was well received by those who were in the right place at the right time [photo by Doug Gochfeld]. 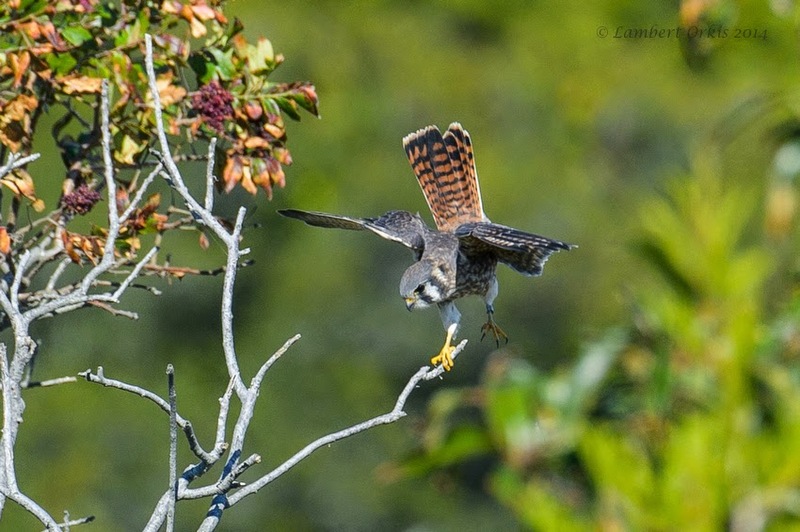 And then there are the falcons... American Kestrels - like this female at the state park - have put on a spectacular show this autumn. Passage often peaks in late September, but there were plenty still passing through over Autumn Weekend [photo by Lambert Orkis]. Cape May's dizzy mix of fall warblers peaks in late September, but even late October offers birds to enjoy and 17 species of warbler were reported over the weekend period. 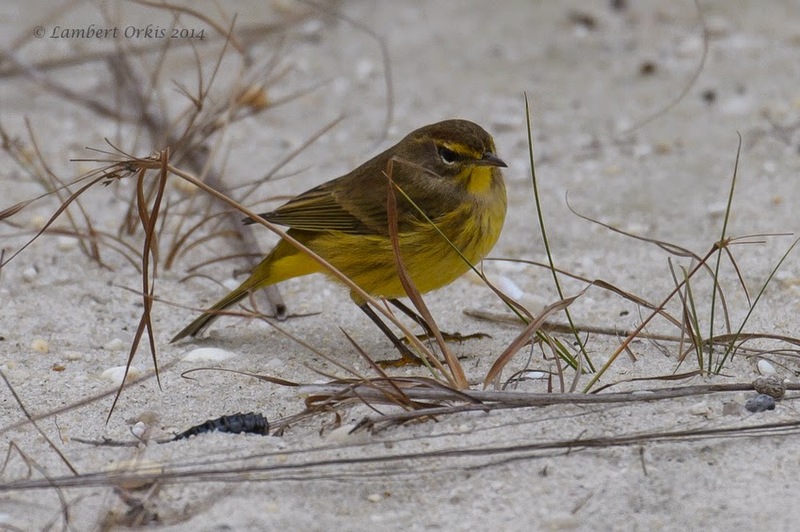 Yellow-rumped Warblers dominated of course, but good numbers of Palm Warbler also passed through - such as this bright yellow, eastern bird [photo by Lambert Orkis]. Late October is the time to start thinking about what the winter might bring, and first indications usually come with the unpredictable arrival of boreal finches. 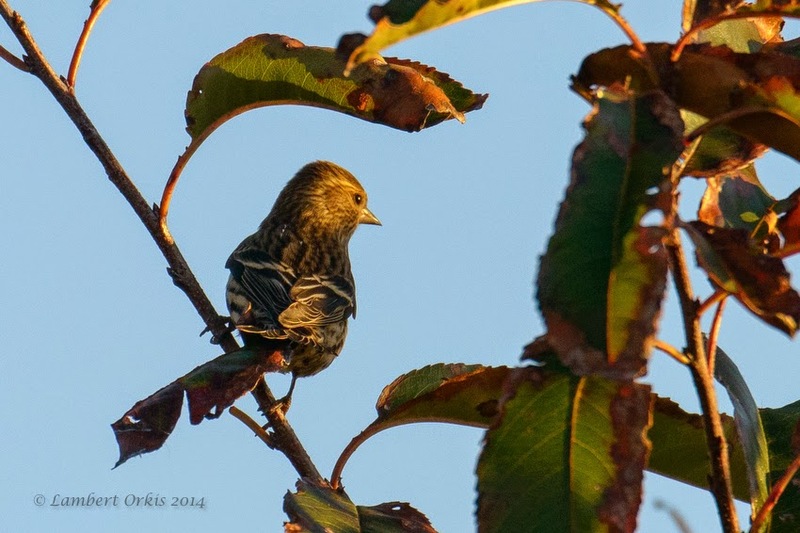 This autumn we are already seeing the start of another big Pine Siskin movement, as increasing numbers head over Higbee Beach or around Cape May Point [photo by Lambert Orkis]. 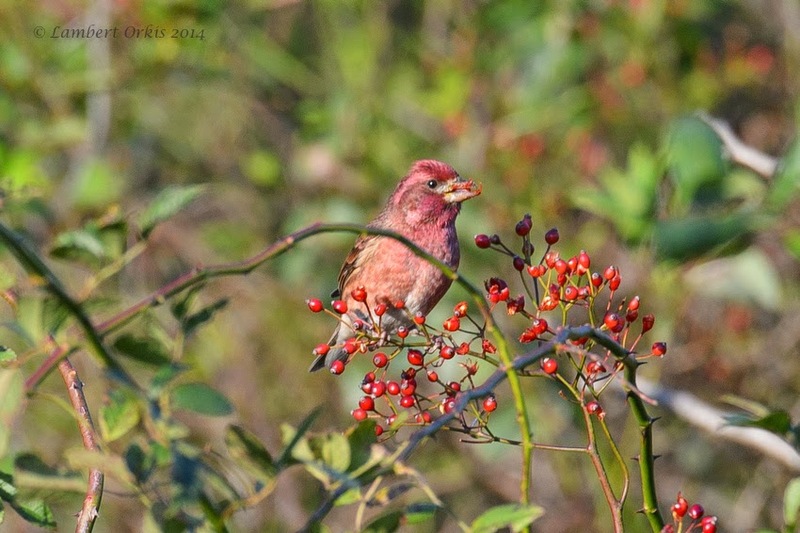 Along with the Pine Siskins, we are seeing notably large numbers of Purple Finches passing through. 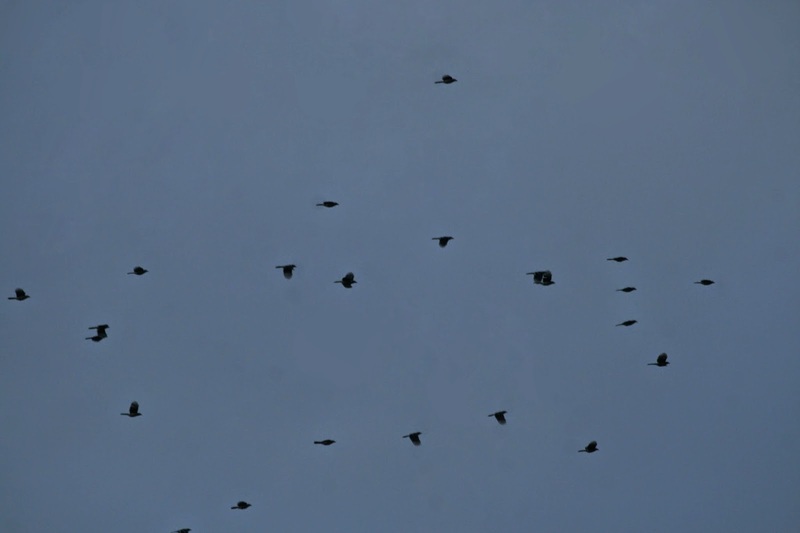 Pretty much anywhere around Cape May in the early morning, you can hear the hollow knocks of these birds as they head south. Alternatively, you can take a walk and look for them along field edges, like this raspberry-colored male at Higbee Beach this weekend [photo by Lambert Orkis]. Whatever the year, kinglets seem always to pass our way, and a run of north-westerlies like we savored this weekend can bring high numbers of them. 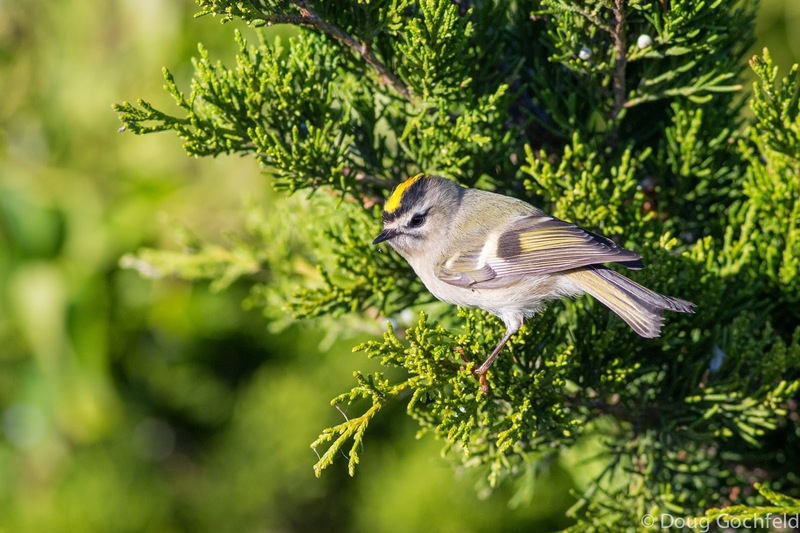 Golden-crowned Kinglets seem prone to over-shooting and finding these tiny bundles of feathers struggling toward land or hopping along the rock jetties on the barrier islands is not uncommon. That such areas have been stripped bare of habitat is certainly something we should be concerned about as life can be on a knife edge when you weigh just 5 grammes [photo by Doug Gochfeld]. The pace of life in the back bays steps up a notch during October too and a boat trip over Autumn Weekend is a great way to see more than just the familiar land birds. This American Bittern put in a show during one of our weekend trips, giving those on board some great photo opportunities [photo by Lambert Orkis]. 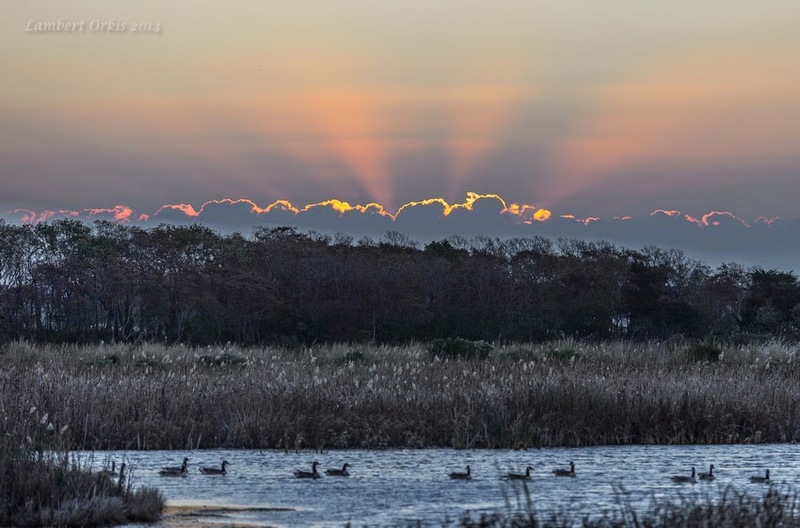 As winter lurks around the corner, waterbirds return to Cape May in good number. 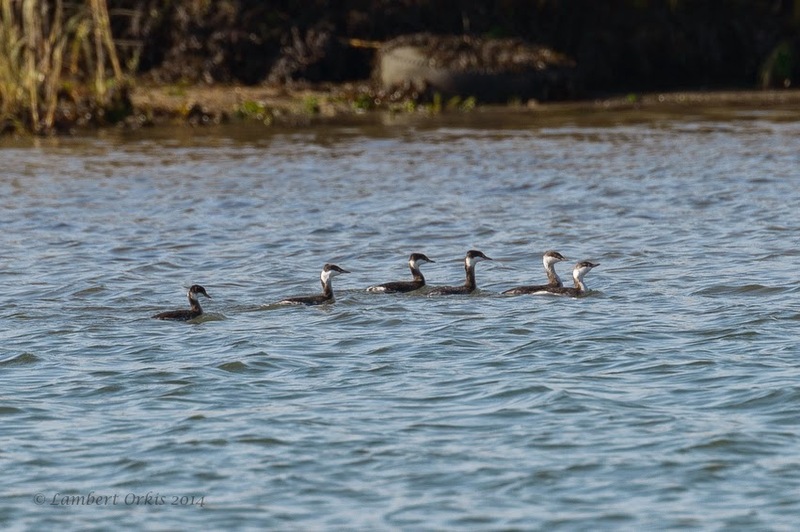 Brant are flocking to the sounds now and this group of six Horned Grebes was a great bonus for those on weekend boat trips aboard The Osprey [photo by Lambert Orkis]. Everybody will have their stories to tell, their highlights, the 'big one' that got on their list, or maybe the 'one that got away'. 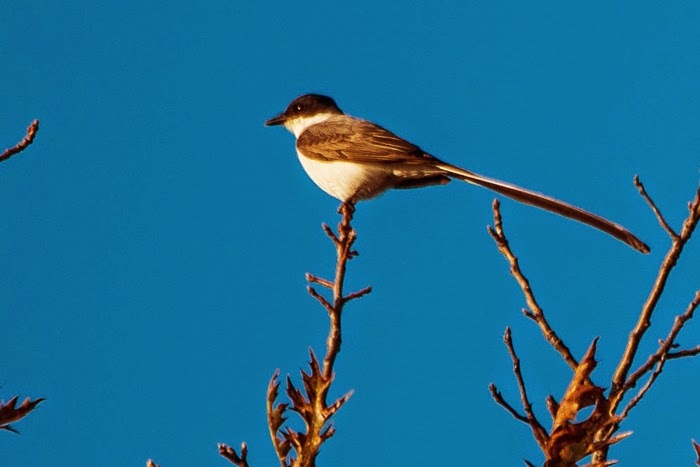 Under both headings, I suspect that this Fork-tailed Flycatcher will find itself highly placed. The first in Cape May since a brief fly-by in 2010, this enigmatic bird was around for at least two days, yet was only glimpsed four times - this photo was taken on Sunday morning, when the bird obligingly cruised over the heads of an Autumn Weekend group at The Meadows [photo by Alex Lamoreaux]. A fine memento for the photographer - since this shot was taken as he calmly took tea on the patio at his home in West Cape May on Saturday afternoon - but a slap in the face for those that missed it (sorry folks! ), this fine shot of our elusive Fork-tailed Flycatcher will at least ensure that it makes the record books [photo by Jake Cuomo]. And so to bed. 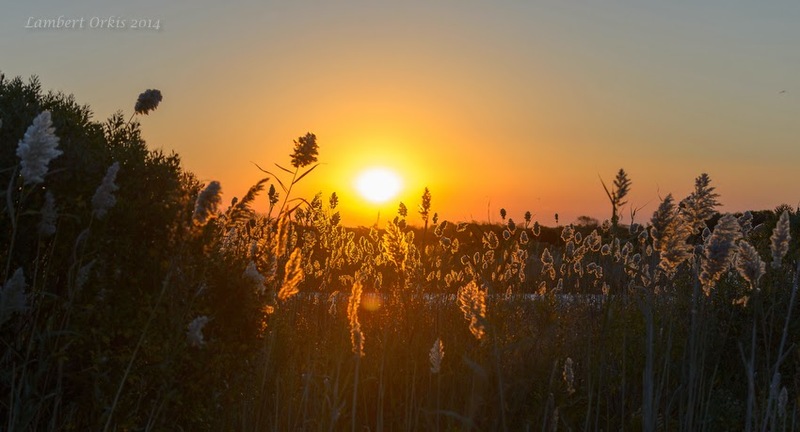 As the sun sets on another spectacular Cape May Autumn Weekend, it's time to start looking forward to the next one, and time to ponder on how best to protect a place that can produce 205 species of birds over a single weekend in late October. 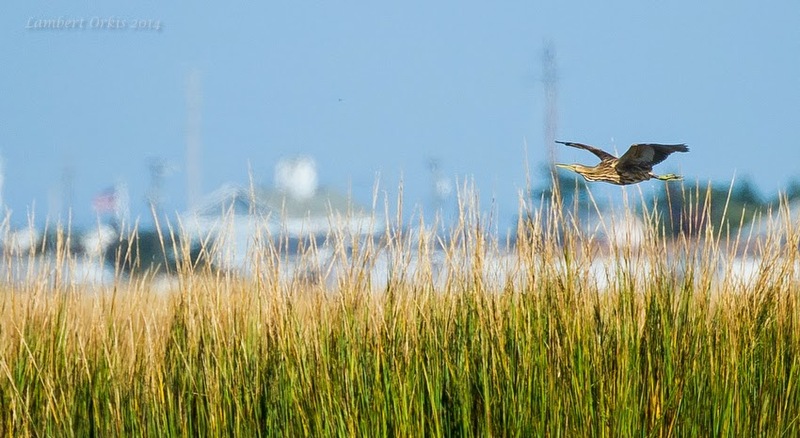 Weather and geography will conspire to bring birds to Cape May, they don't come by choice. It must therefore be beholden upon us to ensure that sufficient good habitat is available to support these birds as they seek food and shelter, until conditions determine that is is time to carry on their way... [photo by Lambert Orkis]. One of the hardest things I have to do at this time of year is pace myself when writing blog posts - just when you feel like telling the world that migration just hit the top shelf, it steps up to another level!! It might sound like another case of crying wolf, just trying to get people to Cape May under false pretexts but, well, if you were here, you would be able to confirm it... Yesterday morning, as I estimated some 400 Blue Jays wheeling around the lighthouse, a sheet of Yellow-rumped Warblers planed in off the bay and Golden-crowned Kinglets skipped through the dune bushes in search of cover, it seemed that fall migration had peaked. And in many ways it had but, like a mountain chain, a fall at Cape May can have many peaks and sometimes they come daily. The peaks happen first thing in the morning, the troughs (when you get a brief opportunity to eat!) happen in the afternoons. Yesterday's mass wave of birds was spectacular, today's was just as fabulous. 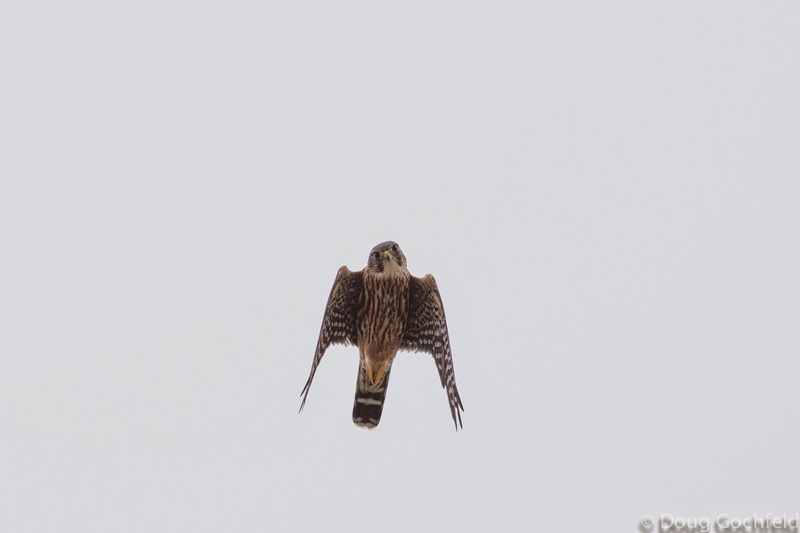 When I left the Hawkwatch Platform a short moment ago, the Killdeer count had passed the 500 mark for the day; Wilson's Snipe were also moving and, despite blustery and damp conditions, Pete Dunne's hawk workshop group were getting spectacular views of passing Merlins, American Kestrels and Northern Harriers. Right in front of the platform, the feeding sparrow flock included Savannah, Field, Song, Swamp, White-throated and White-crowned - as well as the obligatory House Sparrows. The wave of herons and egrets that washed over the point first thing seems to have settled for the day - which means there are American Bitterns out there to be found among the cat-tails. We are heading into a spectacular weekend folks - hope you are going to be part of it!! These visions of yesterday were kindly supplied by Lambert Orkis, who caught just a tiny fragment of the Tree Swallow flock that was wheeling around the bayberry bushes in the dunes, plus wonderful images of two of the young Bald Eagles that battled for air space right over Bunker Pond. Sometimes the stars align, and when they do, you put everything else aside for a cloudier day, and you go stargazing. I’m a person who pours over weather maps, speculating, calculating, planning. How many days since the last big push? Are we early in the season when birds are apprehensive to move on suboptimal conditions, or is it later and has the temperature begun to plummet, driving even the most cold-hardy species southward? So now I’m pouring over the weather forecast, the Global Forecast System (GFS) model to be specific, since it’s the most long-range. I’m looking at the upper-level winds (925mb or ~3500 feet), the surface winds, and precipitation. The forecast is calling for an area of low pressure to move off of the Mid-Atlantic by Wednesday night, setting up northwest winds over the Mid-Atlantic, but likely causing precipitation over New England. This should preclude many birds from leaving the New England coast, but will bring new migrants out of western New York and the eastern Great Lakes instead. By Thursday night the low is expected to be off of Cape Cod, sending us stronger northwest winds throughout the night and into the day on Friday. Again precipitation well to our north should preclude many birds from leaving under these conditions, but birds across New York, including eastern New York, should head south to Cape May. Then as the low tracks north towards Nova Scotia on Friday night, precipitation clears out of southern New England and solid northwest flow builds in over the entire northeastern US, conveying birds down to Cape May once again. On Saturday a cold front will pass over the region, and strong upper-level northwest flow will build in again, this time from the Hudson Bay region of Canada, all the way down into the lower Mid-Atlantic! Again on Sunday night we expect more northwest winds from the northern Great Lakes through the entire New England, Northeast and Mid-Atlantic regions. So there you have it, the stars aligning to bring many birds to Cape May this coming weekend. Of course weather forecasts may change some as we get closer, so be sure to check back with us right before you get here. I hope to see you out in the field as well as inside Convention Hall and enjoying the fantastic workshops and evening programs we have scheduled. If you still need to register, you may do so online here. See you soon! Until then, good birding!! If there is one thing that Cape May really does well, it's bringing people and birds together. 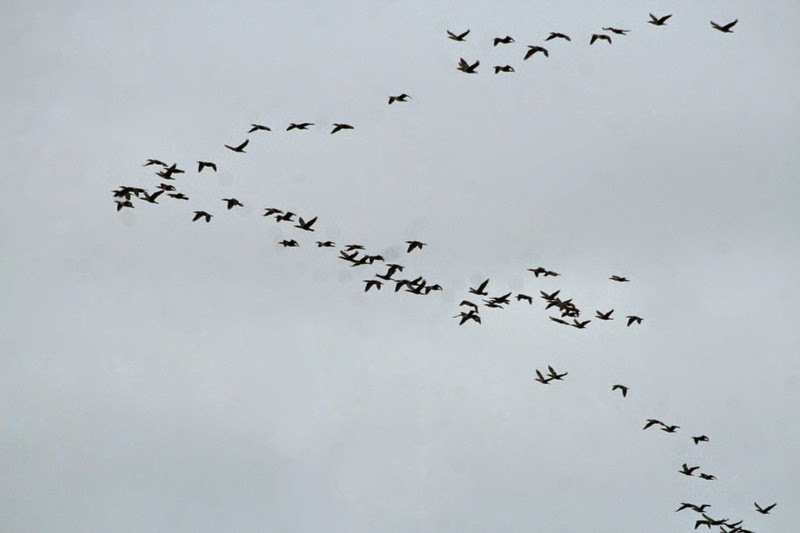 The excitement of a rarity, the anticipation of what the next cold front will bring, or just the sheer pleasure of the exuberance of fall migration. As we enter the final run up to the 68th Annual Cape May Birding Festival, the stage looks set for a wonderful week of birding; this morning's walk at Higbee Beach provided us with great views of the species that might be considered 'classics' of mid-October - Yellow-rumped and Palm Warblers busied through the trees, Swamp and White-throated Sparrows danced through the grassy fields and all the while, Blue Jays flew overhead. Nothing unusual there you might say. And that's the point of this post. 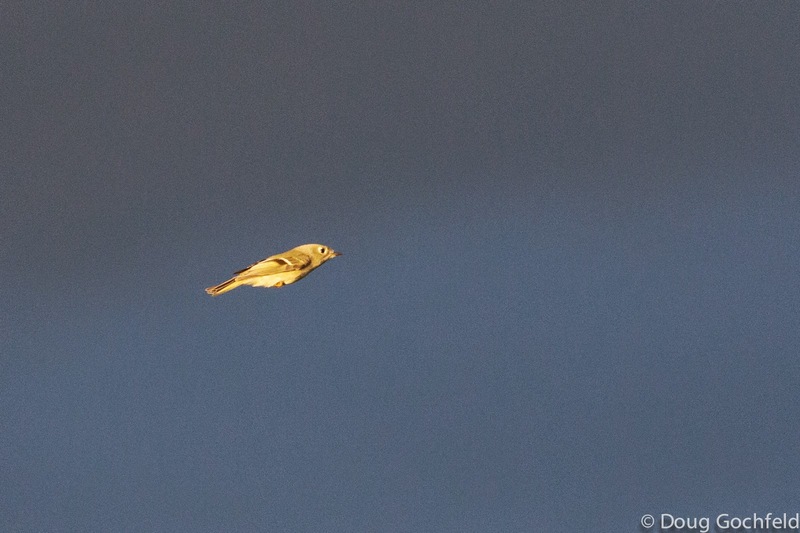 For sometimes, fall migration knocks you out using nothing more than the spectacle itself. Bird populations in temperate regions of the world are at their greatest at the end of the breeding season. A stressful migration, difficult winter, and troublesome return journey, have not yet taken their toll on the year's youngsters. Huge numbers pour south - individual birds may be tiny, but their volume allows us to see them on radar as they head southward. Weather trends start to come into play - a scattered shower here, strong winds there; and even geographical features have an effect - a large coastal bay cuts off rising warm air, offering less than perfect conditions for continuing a journey. The picture is beginning to emerge; Cape May has a fabulous - and fortunate - combination of favorable winds (from the birdwatchers' perspective at least) and geography that mean that birds will and do come our way. Though rarities are certainly a regular feature of a Cape May fall, the excitement of folks in town today was created by nothing more than the pure spectacle of a Cape May Friday, heading into a Cape May weekend - there's no need to wait for the weather forecast, there WILL be birds at Cape May in October!! Think October, think spectacle! Southbound migrants are pouring through Cape May once the cooler days of October really inspire them to head out. While we might intuitively head for the point in September, from October onward it can be more productive spending time at Avalon, where the Seawatch will be producing almost daily spectacles - such as these Black and Surf Scoters heading southward [photo by Mike Crewe]. Double-crested Cormorants always seem to struggle to hold a formation as they head south to the gulf. Large numbers pass through Cape May during October, offering plenty of opportunity to scan for the season's first Great Cormorant among their number [photo by Mike Crewe]. 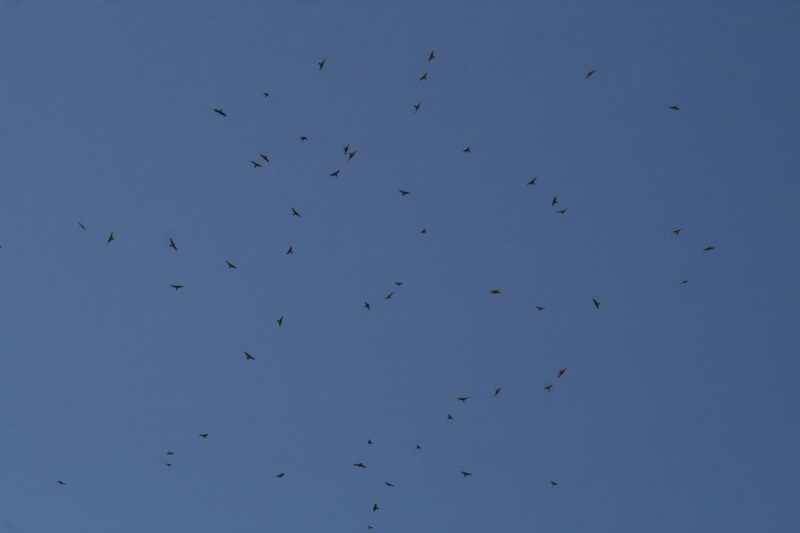 As October draws on, Broad-winged Hawks reach their peak of migration through Cape May. We are too far north to hit the gob-smacking numbers that are counted on migration through Mexico, but these birds still present a fine sight as they circle over the Cape May lighthouse and ponder the Delaware Bay [photo by Mike Crewe]. Higbee Dike can be frustrating at times, as distant specks flash by and remain unidentified. But windy weather in October can drop the birds much lower, offering much better views of birds such these Cedar Waxwings [photo by Mike Crewe]. 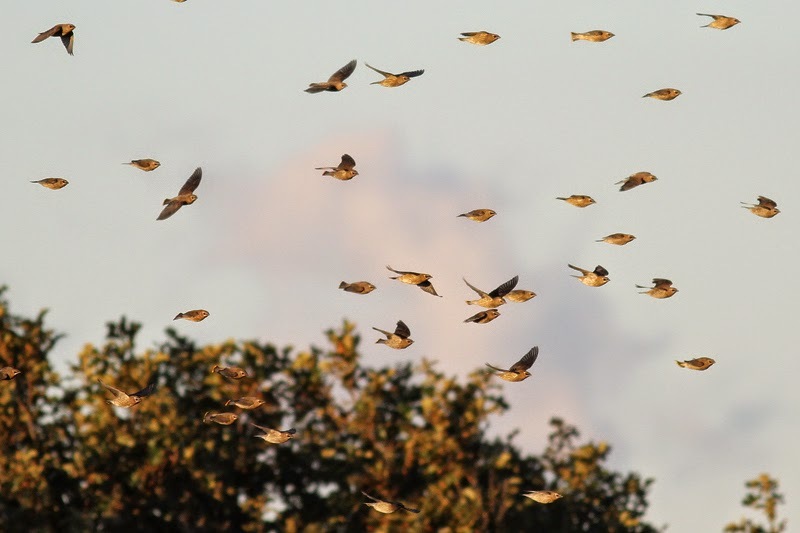 Sparrows feature heavily during October migration and the month offers a great opportunity to study these interesting birds. 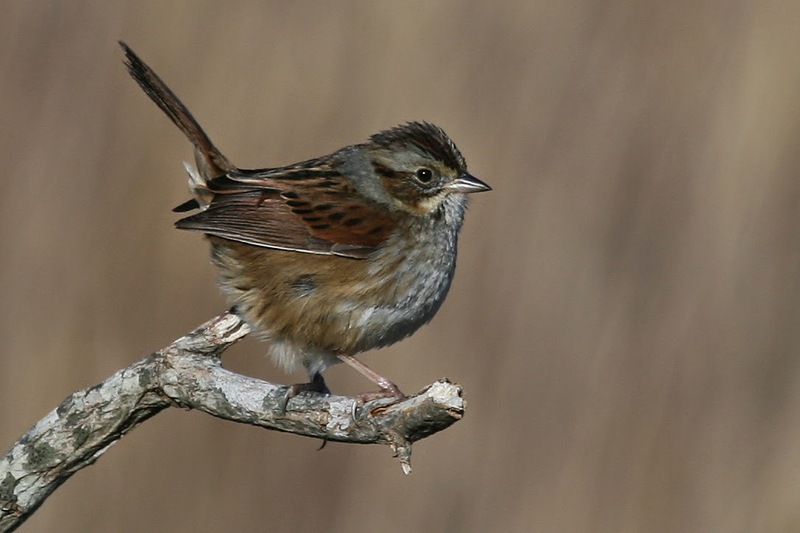 For me, autumn is complete once I get an up close and personal moment with a perky Swamp Sparrow - tail cocked and surveying the landscape [photo by Mike Crewe].